Pakistan hockey’s slump is not quite as dramatic or sudden as it now seems to be. It’s been a painful decline since 1986. Can one imagine a modern-day Football World Cup in which there is no Brazil, Argentina or Germany? It’s almost unthinkable, in fact absurd. The same way it once was to imagine a Hockey World Cup without Pakistan. And yet, last year this is exactly what happened. What’s more, this year the Pakistan hockey side even failed to qualify for the next Summer Olympics. Pakistan hockey’s slump is not quite as dramatic or sudden as it now seems to be. It’s been a slow and painful decline that began when Pakistan not only lost the World Cup title in the 1986 World Cup in England, but also came 11th in the 12-team-event. Yet, it managed to bounce back a bit in the 1990s but by then the game was already vanishing from schools and colleges and it failed to get the kind of media and corporate attention that cricket had begun to attract. So now if only a few school kids were playing hockey, from where did one expect new talent to emerge? It didn’t. Whatever little that did was either not suited to quickly adopt the rapidly changing ways and pace of the game; or wasn’t given the kind of incentives to keep it interested in the game as a profession and not just a low-paying hobby or even national duty. 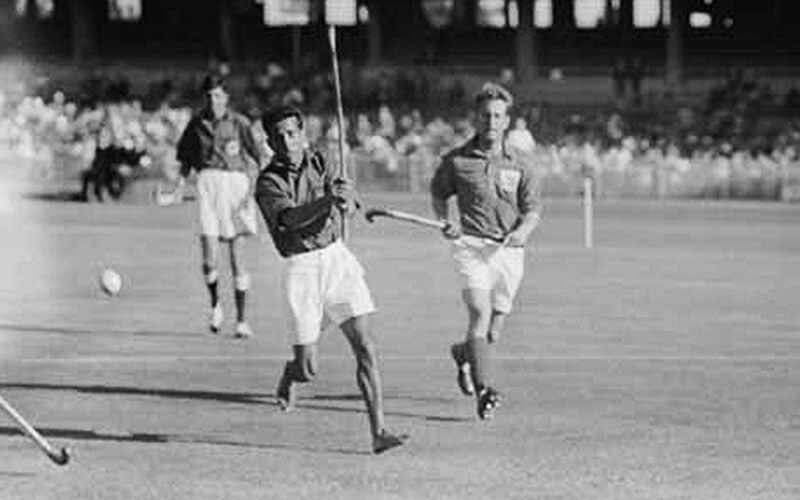 The Pakistan team on the attack against England during the 1956 Melbourne Olympics. The Pakistan side at the time was extremely low on resources. Notice how one of its players is playing barefooted! Pakistan managed to reach the final where it was beaten by India. Pakistan hockey’s slow fall now seems complete. The game could just fade away (and it has), but the problem is, it is still officially Pakistan’s national sport. Early this year the popular military chief, General Raheel Sharif, vowed to help revive the game, and this month when Pakistan failed to qualify for the Summer Olympics, the Prime Minister ordered an inquiry into the team’s latest debacle. Inquiries are only bound to discover what most hockey fans already are well aware of i.e. ever since the early 1990s, Pakistan’s national sport has not been given the kind of attention, resources and respect by those who matter. And one of the most intriguing reasons behind this may also be about how cricket instead of hockey became the sport for many a ruler to exploit its triumphs as a way to express the success of his or her government. 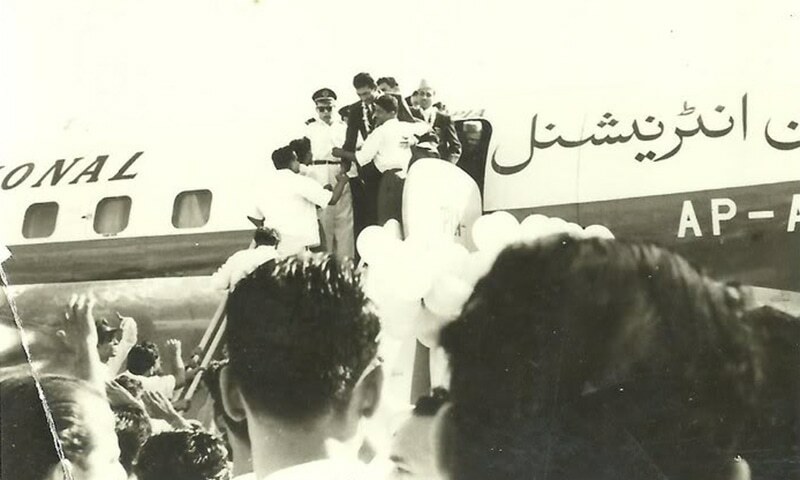 Pakistan hockey players are received by a huge crowd at the Karachi Airport on their triumphant return from Rome. This is an important consideration because the rise of Pakistan hockey too, had its roots in how this sport was elevated by various governments in the past to express and manifest these governments’ robust and winning ways. But the exercise was not always so cynical. For example, when a highly inexperienced and under-resourced Pakistan hockey side managed to make its way into the hockey finals of the 1956 Melbourne Olympics, it was hailed at home for mirroring the fighting spirit and determination of a struggling new nation that had emerged on the map just nine years ago. Contrary to popular belief, hockey was not always the country’s national sport. Actually till the late 1950s, no sport was. In fact when the Pakistan cricket team under its first Test captain, AH Kardar, was producing impressive results, some even suggested that cricket be named as Pakistan’s national sport. But three occurrences jettisoned not only the widespread popularity of hockey in the country, but also made the state finally declare it to be Pakistan’s national sport. A Pakistani player about to smash his team’s winning goal against India in Munich (1972). Kardar’s retirement in 1958 saw the fortunes of the national cricket side plummet (across the 1960s). This gave hockey space to grow more rapidly than cricket. Also, the arrival of the military regime of Field Martial Ayub Khan in 1958 helped the game because at the time sports such as hockey and football were encouraged more in the Pakistan armed forces than cricket. In fact, Ayub is said to have quite a disliking for cricket. The squad that won the 1978 World Cup. It had players that were considered to be some of the most skilful ever seen in field hockey. Lastly, the main catalyst in this respect was the way the Pakistan side stormed into the hockey finals of the 1960 Rome Olympics and defeated India to win its first ever Olympic hockey title. Ayub was firmly at the helm of power and much of Pakistan was basking in the feel-good environment that the regime was radiating at the time. Ayub took the victory and expressed it as a sign of Pakistan’s progress and growth as a society and polity (due to the policies of his regime). It was this skill that bamboozled many hockey sides in Rome and was in full display (to the awe of onlookers) during the Pakistan-India final. 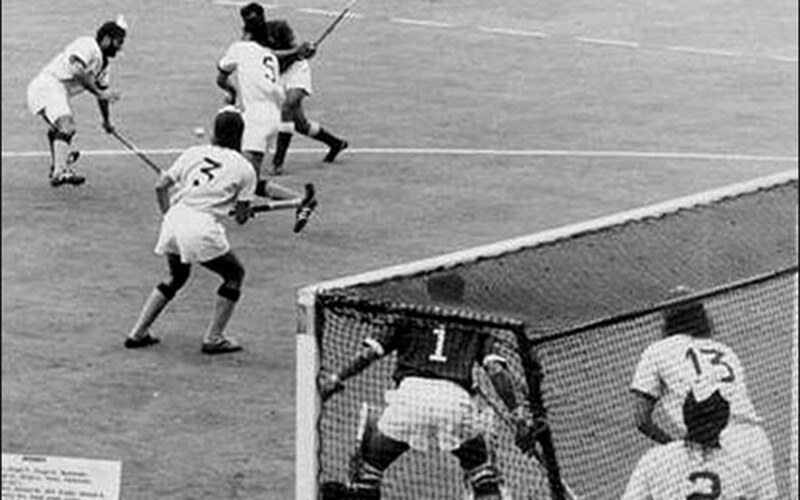 In the 1964 Tokyo Olympics, Pakistan and India managed to make their way in to their third consecutive Olympic hockey finals, but this time Pakistan went down 1-0 in a closely fought match. Pakistan and India had become the world’s leading hockey sides, producing the most skilful set of players. Hockey in both the countries had also become expressions of passionate patriotism in which hockey players were expected to play the game as a foremost national duty and not as a cold profession. 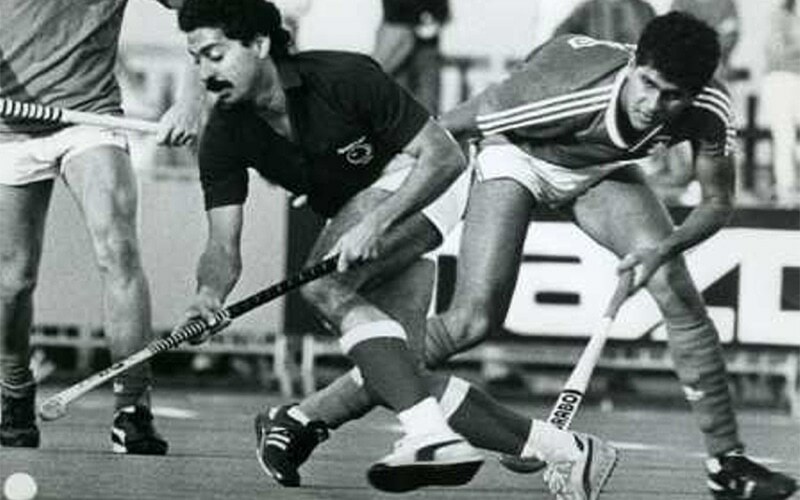 Hassan Sardar dribbling past a Russian player during the 1986 World Cup in England. His team went down in a heap in the tournament. During the 1968 Olympics in Mexico City, the Pakistan side dribbled its way into its fourth consecutive Olympic hockey final where it defeated Australia 2-1 and in the process lifted its second Olympic hockey title. Pakistan had become the world’s number one hockey team and the most attractive in style and skill. Hockey had thrived and grown under the ‘liberal’ Ayub dictatorship, but ironically, when the team lifted its second Olympic title in Mexico City, the regime was being cornered by a concentrated left-wing student and workers movement. The movement forced Ayub to resign in early 1969 and hand over power to another military man, General Yahya Khan, who promised to hold the country’s first general election based on adult franchise. But Pakistan hockey marched on, unscathed by the turmoil. Or was it? In 1970, the Pakistan hockey chief, Nur Khan, floated the idea of launching a Hockey World Cup. The sport’s international body immediately agreed and aptly offered Pakistan to hold the first ever Hockey World Cup (in 1971). But by mid-1971, the political situation in the eastern wing of the country (East Pakistan) was rapidly deteriorating. During the 1970 election, the Bengali nationalist party, the Awami League, had swept the election in East Pakistan, whereas two left-wing parties, the populist Pakistan Peoples Party and the Baloch-Pukhtun nationalist outfit, the National Awami Party, had won the majority of the seats in West Pakistan. Awami League became the largest party in the parliament, but when a three-way struggle for power ensued between Awami League, PPP and the Yahya regime, civil war erupted in East Pakistan between Bengali nationalists and the Pakistan military. The bloody commotion forced the international hockey federation to shift the event to Spain. Here, Pakistan won its way into the final (after defeating India in the semi-final) and then defeated a resilient Spain 1-0 to lift hockey’s first ever World Cup. Three months later (in December 1971), Pakistan broke up when East Pakistan became the independent republic of Bangladesh. Yahya was forced to quit by a group of angry officers and PPP’s ZA Bhutto was invited to form a new government. Bhutto had constantly accused the international community (except China) of undermining Pakistan’s position in the East Pakistan conflict and siding with Bengali nationalists and their main backers, India. An edgy Pakistan hockey team arrived to participate in the 1972 Munich Olympics. It fought its way to enter the semi-finals where it was to face a resurgent Indian side. A siege mentality had gripped the country and it also made its way into the hockey squad. The evening before the match, the Pakistan squad began to play (on an LP player) famous patriotic songs sung by Pakistani diva, Noor Jehan, that she had sung during the Pak-India wars of 1965 and 1971. The idea was to not only play the songs to inspire the Pakistani players (against arch-rivals India), but to also unnerve the Indian players who were lodged in the same building. In a tough, tight game, Pakistan managed to down India 2-0 and the millions in Pakistan listening to the commentary on their radio sets, erupted, pouring out on to the streets and shouting patriotic slogans. Bhutto immediately dispatched a passionate congratulatory message to the team. After defeating India, Pakistan entered its fifth consecutive Olympic hockey final. Its opponents this time were the Germans, who unlike the Pakistanis, relied more on power than skill. This final turned out to be (and still is) perhaps the most controversial game ever witnessed in the international hockey arena. To begin with, both the teams played rough and the referees had to continuously issue warnings and cards. After the sides had blunted each other’s attacks, the Germans finally managed to score in the 60th minute of the turbulent game. The Pakistanis cried foul and accused the Belgian referee of cheating. At the final whistle, scores of Pakistani fans rushed into the ground and poured buckets of water over the referee. Then during the awards ceremony, Pakistani player ripped off their silver medals, and some even began swinging them with their hockey sticks and shoes. The spectacle was captured by German TV and relayed across the world (including Pakistan). Highlights of the turbulent Pakistan-Germany hockey final at the 1972 Munich Olympics. It also has images of Pakistani players protesting by tossing off their medals. Though the team was greeted by a wave of sympathy by the fans back home, the International Hockey Federation banned 11 Pakistani players for life! The Pakistan government appealed and eventually the ban was reduced to 3 years. Thus an inexperienced Pakistani side travelled to Amstelveen in the Netherlands in 1973 to defend its World Cup title. It managed to top its pool but went down 1-0 in its semi-final against India. Two years later in Malaysia (1975), Pakistan and India met for the first time in a Hockey World Cup final. This was Pakistan’s second World Cup final and India’s first. The match was beamed live by Pakistan Television, and millions watched as Pakistan went down 1-0 to a renascent Indian side. Newspaper reports claimed that many Pakistanis smashed their TV screens and accused the Pakistani players of "being drunk" and "complacent". The Bhutto regime stepped in and neutralised the charged atmosphere by congratulating the team for making it to the finals, even though it did ask the Pakistan hockey board to begin infusing new blood into the side. During the 1976 Montreal Olympics, Pakistan for the first time (after 1956) failed to make it to an Olympic hockey final. Though it topped its pool, it went down 2-1 against Australia in the semi-final. Pakistan had failed to win a major hockey event for more than 3 years (though it did win the 1974 Asian Games hockey final), the team that was emerging was a lot more dashing. It coupled its traditional skills with a new emphasis on speed. By the time the team reached Argentina for the 1978 World Cup, it had in its ranks two of the quickest movers on a hockey field: Islahuddin and Samiullah. Thus began a most remarkable era in Pakistan hockey. It won its second World Cup title in 1978 (defeating the Netherlands in the finals), and then launched the Champions Trophy in Lahore that consisted of top 8 hockey teams of the world. It won this too (defeating Australia in the finals). The Bhutto regime had been toppled in a reactionary military coup in July 1977. The new ruler, General Ziaul Haq, first basked in Pakistan cricket team’s victory against India in 1978 and then in the hockey team’s two world titles the same year. Highlights of the 1978 World Cup final. Pakistan had risen to become a formidable force in world hockey. In Pakistan, pictures, posters and interviews of the Pakistan hockey players outnumbered those of the cricketers. Though at its peak, the team did not participate in the 1980 Moscow Olympics that was boycotted by countries opposed to the Soviet Union’s invasion of Afghanistan. However, Pakistan did win the 1980 Champions Trophy held in Karachi. This was also Pakistan’s first major victory on AstroTurf that was coming into use a lot more after it was first introduced in 1976 during the Montreal Olympics. But, despite the fact that Pakistan had been the number one side in international hockey since 1978, the players were still not receiving even half of what the country’s cricketers were making. Pakistani cricketers had managed to get their fees increased considerably during Mushtaq Mohammad’s captaincy (1976-79). The hockey players were rewarded with positions in various government departments and organisations, but their playing fee remained incredibly low. Players were still expected to play for Pakistan as a selfless national duty because hockey at the time had also become Pakistan’s most recognisable facet and face in the world. The team did not disappoint when in 1982 it won its second consecutive (and its third) Hockey World Cup title. It routed Germany 3-1 in Mumbai, India, in front of a packed stadium and millions of TV viewers. Zia, whose government was facing stiff resistance from the opposition, explained the victory as a reflection of Pakistan’s prowess as a country (under his regime) and the team’s return to Pakistan was given extensive coverage on state-owned media. Though the team had boycotted the 1980 Olympics, it revived its Olympic triumphs by reaching its 7th hockey Olympic finals, this time at the 1984 Los Angeles Olympics. It then went on to win its 3rd hockey Olympic title, defeating West Germany 2-1. Pakistan hockey had reached dizzying heights, winning two World Cups, two Champions Trophy titles and one Olympic gold within a span of just six years (1978-84). Though cricket and squash too, were enjoying a rise in fame and success, hockey remained to be the country’s most popular and fruitful sport. Cricket (with its promise of better financial rewards and glamour) was slowly replacing hockey in schools and colleges. And since much of the hockey was now being played on AstroTurf, Pakistan oddly had just two AstroTurf stadiums, despite the fact that it was the world’s number one side. Hockey clubs in the country still played and trained their players on grass and these players struggled when they graduated to playing top level local tournaments on AstroTurf. The problem burst out into the open when hockey maestro, Hassan Sardar, led a young Pakistan hockey squad to the 1986 World Cup in England. Pakistan was routed in almost every game that it played! The nation was shocked. The government ordered an immediate inquiry and the media quoted top players bemoaning the fact that they were paid peanuts (compared to the cricketers), and were admonished by the hockey federation and the government for requesting an even nominal pay increase. Shahid Ali Khan who was at the time the country’s top goalkeeper told the media that players received just Rs 27 per match (!) and that they had been made to feel like traitors by the government whenever they asked for an increase. Zia passed away in 1988 and fresh elections were held. Pakistan hockey entered a regenerative and rebuilding process, as cricket and squash continued to overtake it in popularity. The first Nawaz Sharif and the two Benazir Bhutto regimes encouraged corporate sponsors to invest in hockey. They also slightly raised the players’ fees, and ordered the laying down of more AstroTurfs. This did help Pakistan hockey witness a mini-revival, starting in 1990 when the 7th Hockey World Cup was held in Lahore. Pakistan galloped its way into the final where it lost to Holland in front of a packed stadium. Then, in 1991, it managed to make it to the finals of the Champions Trophy too (in Germany), but lost the game. Despite the losses, Pakistan was once again rising in world rankings and finally in 1994, it managed to bag its 4th World Cup title (in Sydney, Australia). Pakistan hockey was back on track. But despite becoming world champions (for a record 4th time), the players’ fees remained low and so did corporate interest. All attention in this regard was being shifted towards cricket. A decade later, hockey had begun to simply disappear from schools and the country’s hockey board kept going bankrupt, so much so, that in the last few years, the board often requests private parties to fund the team’s foreign tours. After the 1994 triumph, and a few Asian titles, the Pakistan hockey team hasn’t won a single major hockey tournament. Hockey as a national sport has become a game of which the current cricket-crazy generation has very little knowledge of or interest in. In fact, most young Pakistanis today know the names of European club football players than they do of the current Pakistani hockey players! A sport in which so much pride and passion was once invested and which became the honoured expression of a resilient nation, has sadly been allowed to just wither away. This article was originally published on Dawn.com.